Luka Jovic is the Bundesliga's most prolific forward this season and his performances for Eintracht Frankfurt have not gone unnoticed. With a league-high 14 goals and 20 in all competitions, Jovic has been linked with Barcelona and reports have even gone as far to say the 21-year-old already has a personal agreement to join the LaLiga champions. A product of Serbian giants Red Star Belgrade, Jovic – like many before him – was lured away from the capital by Benfica in 2016. He only made four appearances at Estadio da Luz, eventually moving to Frankfurt on a two-year loan deal. The transfer included an option to buy and Frankfurt's decision to invest in Jovic has proved to be a masterstroke when you consider the reported fee stands at €7million and they could be set to receive in excess of €40m for the Serbia international. Jovic's value has soared this season following an eight-goal Bundesliga campaign in 2017-18. 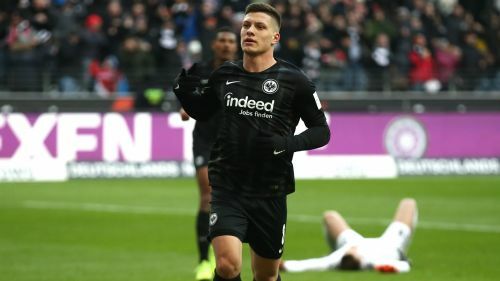 Through 22 rounds this term, Jovic has more league goals than Bayern Munich star Robert Lewandowski (13), Borussia Dortmund captain Marco Reus (13) and Paco Alcacer (12). Jovic, who has already made history after becoming the youngest player to score five goals in a Bundesliga match during October's 7-1 rout of Fortuna Dusseldorf, has a better minutes-to-goal ratio (94) and shot conversion rate (31.82) than Lewandowski (144.46 and 21.31) and Thomas Muller (376.5 and 14.29), per Opta data. His shooting accuracy (54.55) is also far superior to Lewandowski (39.34), while Jovic has also converted eight "big chances" and created 16 opportunities - making him a versatile threat up front. "I've never seen a 20-year-old with this quality." With another six goals en route to the Europa League last 16, in-demand Jovic is seen as the ideal successor to Luis Suarez at Camp Nou. And as the goals continue to flow, Barca may be set for a transfer war amid interest from rivals Real Madrid and Chelsea.